Night Flees the dawn as the brightening blue overtakes the Milky Way. Kneeland Road, Humboldt County, California. March 17, 2019. I pulled into the turnout and shut off the engine and lights. The stars jumped out and I joined them. Above the horizon the core of our galaxy glowed in the last darkness of the night. I smiled. Hello, Darkness, my old friend, I thought. It seemed apt, though it was the sight of the Milky Way’s bright center in the sky for the first time in months that most excited me. It’s the largest cosmic structure we can see, a fascinating reminder of the unimaginable vastness and mystery beyond our world. A bend in the road ahead beckoned. Beyond the turn lay… what? My imagination rose. Metaphor for many things, a road can hold unique feelings or meanings for each of us. To one person the road may lead outward toward places undiscovered, while to another it will bring one’s thoughts home to perhaps reveal a mystery within. It occurred to me that within and without are but two ends of a spectrum of awareness and existence. The mysteries of road and cosmos coming together called to me. Metaphorically I didn’t know where the road led beyond that curve. How could I when I knew it would lead each of us to our own destinations? That was the fascination for me. This road led anywhere. Even if it takes one nowhere, then that is where one is. What is beyond the bend for you? One road may take you home. Another leads you away. And some will take you inside yourself. Where are you going today? Humboldt County, California. Pre-dawn, March 17, 2019. We live in the Milky Way galaxy. It’s a flattened pinwheel shape, and our solar system is out on one of the arms. Our galaxy gets its name from the brighter band of stars, called the Milky Way, which we can see stretching across the night sky. The band is an edge-on view from within the galaxy; it is what we see as we look through the thick part of the pinwheel comprising all of the stars, nebulae and everything else that lie between us and the other side of the galaxy. 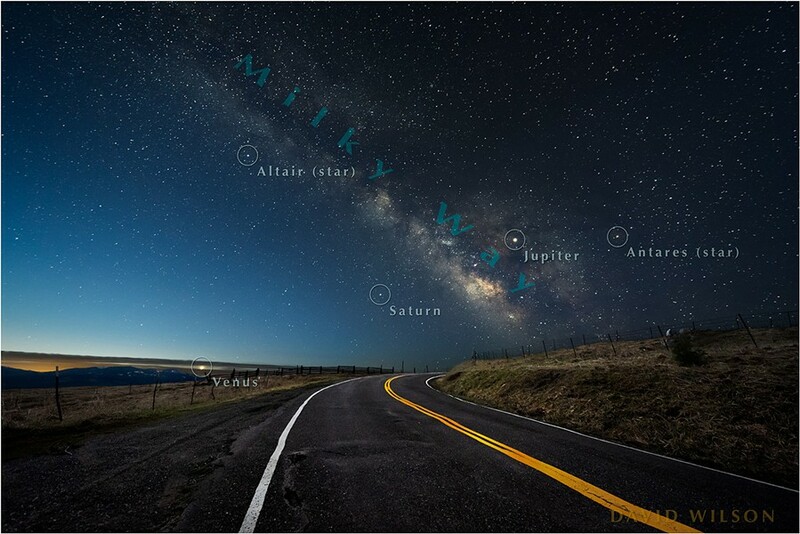 When one looks into the night sky to either side of the Milky Way’s band, we are looking outward from the galaxy’s plane. Here there are fewer stars, and beyond them lies the great space between galaxies. The brightest, most detailed area of the Milky Way is the galactic core. We can’t always see the core because as Earth moves around our sun in its year-long trek, each night of the year our dark side faces a slightly different view of the sky. As a result, some times of the year the core of Milky Way seen in these images isn’t always in view at night. In the northern hemisphere in winter Earth’s night side faces the fainter stretches of the Milky Way. As we leave winter and spring approaches, we begin to have a view of the core in the early pre-dawn hours. 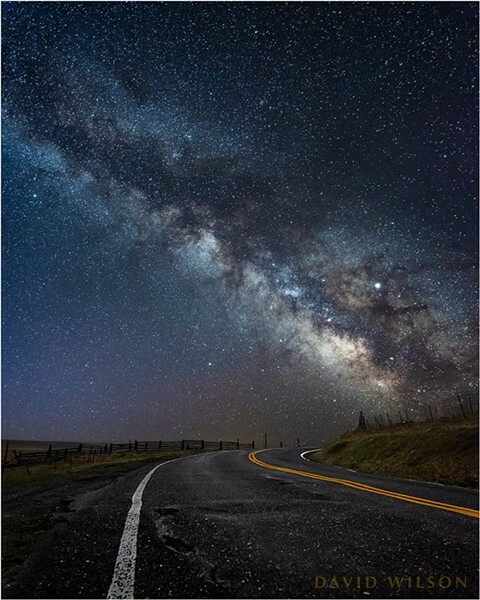 Toward the end of May the Milky Way’s position in the sky at 1:30 a.m. is similar to the predawn view in late March. In late June, the core will be low on the southeastern horizon when darkness falls, and it will be higher in the sky each night immediately after dark through the summer. To keep abreast of David Wilson’s most current photography or peer into its past, visit and contact him at his website mindscapefx.com or follow him on Instagram at @david_wilson_mfx .